Curran - the new Carbon Fibre - made from Carrots! The humble carrot is set to be used in ways never imagined before, thanks to a discovery by two Scottish scientists who have found a way to convert the vegetable into an advanced material to make products from fishing rods to warships. The development is the brain-child of Dr David Hepworth and Dr Eric Whale, who have created the material, named Curran, at their company CelluComp in Burntisland, Fife. Their first product - a rod for fly fishing - is already on sale. But they are not stopping there. The pair now plan to move on to make snowboards and car parts and say the material could also be used to make engineering components and even battleships. Read about the carrot fibre helmet here. The material is also more environmentally friendly than current methods using glass and carbon fibres. Dr Hepworth said they believed Curran would be one of the major material innovations since the introduction of carbon fibre over 30 years ago. At the moment, the company can make materials which are around 80 per cent carrot, with carbon fibre making up the remainder. 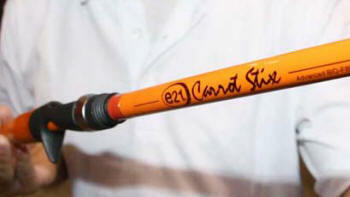 The new "Just Cast" rods are around 50 per cent carrot - each made with around 2kg of the vegetables. But it is hoped that as the technique is developed, they will eventually be able to make products which are made from 100 per cent biological matter - carrots and other plants. Dr Hepworth said they were already looking at using other vegetables such as turnips, swede and parsnips. The inventor said the material was kinder to the environment because carrots are a renewable resource - unlike the oil used to make carbon fibres. And he said that when the material was burnt, the carbon it created was cancelled out by the carbon absorbed by the carrots when they were growing. The process basically involves taking carrots and breaking them down into small particles using a special mechanical process. The material is made through a top secret process, nano fibres found in carrots are extracted and combined with high tech resins enabling tough, durable components to be moulded to whatever shape, degree of stiffness, strength or lightness required. The strong nano-fibres from this carrot "soup" are then extracted so that they can be processed in a variety of ways. Most of the water is removed and hi-tech resins are added to the mix. This mixture can then be moulded and heated to make a strong material. The same technique could now be applied to other vegetables, such as turnips, swedes and parsnips. Can you imagine it? Driving around in cars that are eighty per cent carrot? While the properties of other root vegetables work just as well, it is the carrot the scientists find most seductive." We've focused on carrots because there is a good local source of them in Fife and they are easy to process," explained Dr Hepworth. "We also don't want to use prime vegetables because that would mean taking them away from the agricultural food sector." But around 30% of carrots get rejected, and local producers supply us with the secondary source not used for human consumption." Through their company CelluComp Ltd, launched three years ago, the duo are initially enter the sporting goods market with the launch of a range of fishing rods. Dr Whale said: "We opted for the sporting goods market as it is more receptive to new materials. Latest News: Rods Wins Best of Show! 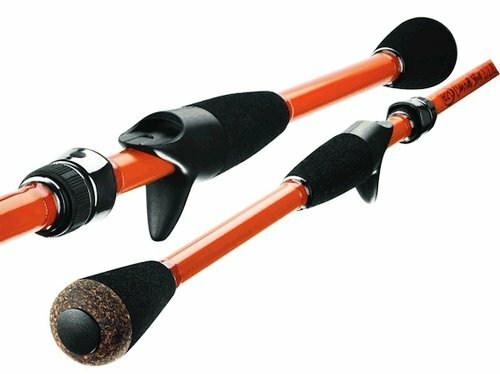 At the American Sportsfish Association 50th annual convention, ICAST (International Convention of Allied Sportsfish Trade), the E21 Fishing rods scored major brownie points taking Best of Show for their E21 Carrot Stix and the E21 Fusion surf fishing rod won best salt water rod. That is quite a performance in the face of very stiff international competition. 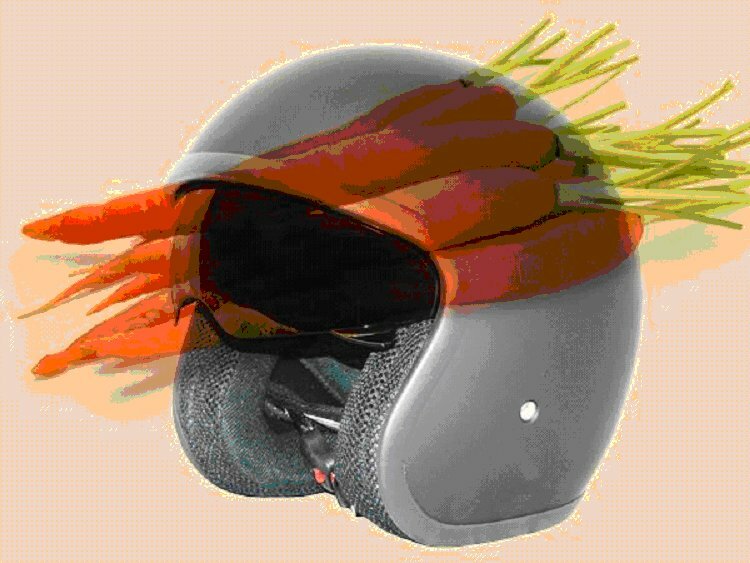 A Motorcycle Helmet Reinforced by Carrot Waste? All over the world, research is being conducted into biodegradable and recyclable synthetics. However, fiber-reinforced components remain problematic - if glass or carbon fibers are used. Within the scope of an EU research project, the Scottish company Cellucomp Limited has now developed a method to obtain nanofibers from carrot waste. These fibers would be both cost-effective and biodegradable. However, is the method, which works in the lab, also marketable on a large scale? An MPAS (multi-perspective application selection) method developed at Empa helps identify the industrial sectors where new materials might be useful from a technical and economical perspective. At the same time, MPAS also considers the ecological aspect of these new materials. The result for our example: Nanofibers made of carrot waste might be used in the production of motorcycle helmets or side walls for motorhomes in the future. In order to clarify a new material's market potential, Empa researchers Fabiano Piccinno, Roland Hischier and Claudia Som proceed in three steps for the MPAS method. First of all, the field of possible applications is defined: Which applications come into question based on the technical properties and what categories can they be divided into? Can the new material replace an existing one? The second step concerns the technical feasibility and market potential: Can the material properties required be achieved with the technical process? Might the product quality vary from one production batch to the next? Can the lab process be upgraded to an industrial scale cost-effectively? Is the material more suited to the low-cost sector or expensive luxury goods? And finally: Does the product meet the legal standards and the customers' certification needs? In the third step, the ecological aspect is eventually examined: Is this new material for the products identified really more environmentally friendly - once all the steps from product creation to recycling have been factored in? Which factors particularly need to be considered during production stage to manufacture the material in as environmentally friendly a way as possible? The MPAS approach enables individual scenarios for a future production to be calculated with an extremely high degree of accuracy. In the case of the carrot waste nanofibers, for instance, it is crucial whether five tons of fresh carrots or only 209 kilograms of carrot waste (fiber waste from the juicing process) are used as the base material for their production. The issue of whether the solvent is ultimately recycled or burned affects the production costs. And the energy balance depends on how the enzymes that loosen the fibers from the carrots are deactivated. In the lab, this takes place via heat; for production on an industrial level, the use of bleaching agents would be more cost-effective. Conclusion: six possible applications for "carrot fibers"
For fiber production from carrot waste, the MPAS analysis identified six possible customer segments for the Scottish manufacturer Cellucomp that are worth taking a closer look at: Protective equipment and devices for recreational sport, special vehicles, furniture, luxury consumer goods and industrial manufacturing. The researchers listed the following examples: Motorcycle helmets and surfboards, side walls for motorhomes, dining tables, high-end loudspeaker boxes and product protection mats for marble-working businesses. Similarly detailed analyses can also be conducted for other renewable materials - before a lot of money is actually invested in production plants.